Raising children is just plain hard; especially when it comes to discipline. Today’s society has given too much power to the child and come so far away from what biblical standards are. 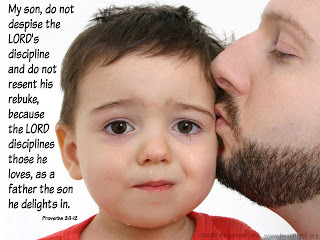 King Solomon wrote in Proverbs 13:24, “If you refuse to discipline your children, it proves you don’t love them.”. That’s right. If we are falling short in the discipline area, we are not showing our children love – Godly love. We must love our children enough to take a stand against wrong behavior. In 1968, Bill Milliken wrote a book called Tough Love. Since then, it has been a common word or phrase to use when we need to be tough, but loving at the same time. The most important word here is LOVE. Discipline should always be done out of love and in love. This type of tough love dates all the way back to the Garden of Eden. Adam and Eve were the first children of God to inhabit the earth. They had so much freedom, joy and an amazing relationship with God. But, just like parents of today, God had rules for Adam and Eve and breaking those rules meant there were consequences. Do you think God said, “I already told you not to do that, now go sit in time out and don’t let it happen again”? I am sure Adam and Eve wished He had. However, for the sake of humanity, God had to demonstrate tough love. It was not because he didn’t love them; it was because he did. Being a mother of 5 children ranging in age from 14 to 3, I have had my fair share of dealing with the challenges of tough love. I have not always demonstrated discipline in the ways I should have. Sometimes, it may have been too harsh and other times not harsh enough. Discipline and tough love take time, and sometimes I just didn’t make the time or put the effort into it that I should have. Honestly, sometimes it was just easier to give in. Unfortunately, in doing so, I am not loving my child with a Godly kind of love. I am so thankful that I have a God that loves us with a “tough” kind of love when we need it. It keeps us on track, provides us with guidance, and pushes us in the direction we need to be going. It refines our character, teaches us endurance, and keeps us from hurting ourselves. God shows us this tough kind of love all throughout scripture: Genesis 3 when Adam and Eve were escorted out of the Garden of Eden, Genesis 6 and the destruction of mankind with The Flood, the judgment of Sodom and Gomorrah in Genesis 19. We can also see an example of this in the New Testament with the story of Ananias and Sapphira in Acts 5:1-11. We must have the courage to demonstrate this kind of love in our lives. When we don’t, we are saying our children are not worth the time and effort. Yes, God’s tough love differs from ours, but we can learn a lot from the way He parents His children throughout scripture. But we all, with unveiled face, beholding as in a mirror the glory of the Lord, are being transformed into the same image from glory to glory, just as from the Lord, the Spirit.” 2 Corinthians 3:18. The answer….I am His beautiful daughter. This is not conditional on anything I do or how well I do it. The world does not define my beauty, my God does. I know this, yet my heart has a hard time receiving this and walking in agreement with it. God is doing a work in me. Even as I type this, He is lining up my thinking to His thinking. He wants me to begin to see myself through His eyes and His perspective. I think He wants the same for you. And on the other side they wrote the words they felt the Lord had laid on their heart for me as part of my destiny. Once again, did I believe it? Did I believe God’s Word? Did I believe its power? Was it powerful enough to penetrate, divide, and judge the thoughts of my mind and attitude? Did I believe these words they shared about “me” were from God? If so, that meant picking up my sword, as they asked, and walking in agreement with who God said I am. I picked up my sword, excited in the moment to embrace the call. I knew, without a doubt, it was from the Lord. Days later, reality set in, and I wasn’t walking out His call. I doubted who He said I was. Why? I felt and still feel unworthy. As God is doing a work in me now, I am beginning to understand why I feel unworthy as I hear Him ask me these questions, “Jeni do you see yourself as my beautiful creation? When you look in the mirror do you see the beauty that I see? 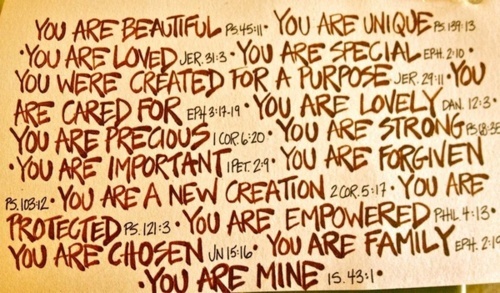 When I look at you, Jeni, I am so well pleased with what I created, why aren’t you?” Ladies, if I want to walk out my call, I first have to believe that I am beautiful, that I am a fearfully and wonderfully made. What is it you need to believe about who you are, so you can then walk out what you are called to do? As Jeremiah received these words from His Father, he felt unworthy! Wow! He felt the same way I feel when my Father tells me who I am. But, you know what, Jeremiah walked in his identity, he embraced his call, and he made a Kingdom difference. Now let’s you and I do the same.